Penelope Adams Moon has written a compelling article regarding liberal education and online learning entitled “Teach Online…Before It’s Too Late.” The article appears in Inside Higher Ed. In this piece, Moon advocates for online learning in the context of faculty deliberately shaping it through governance. Moon then explains how this progress should happen, particularly in the context of liberal education. Today’s post features two simple examples of how faculty and students can use Piktochart to create infographics that serve dual purposes. 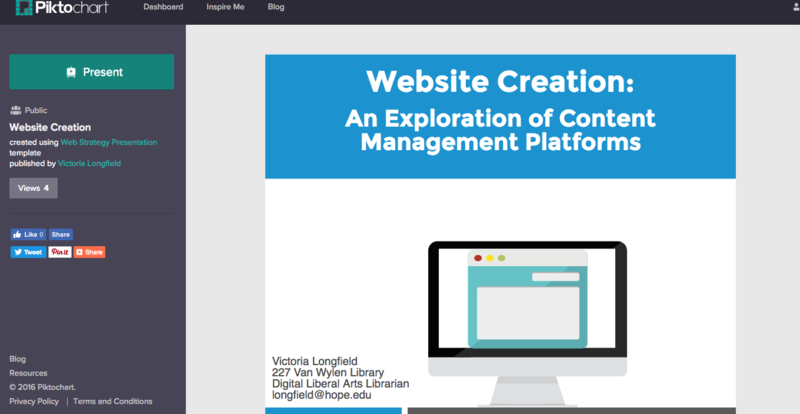 In the first infographic example, “Website Creation,” Victoria Longfield built an infographic to help faculty and students understand options when considering building a website. Her project functions as a “regular” infographic. You can access it and read it from top to bottom, and even print it out as a poster if you want to. However, Longfield designed the project to also function as presentations slides for use during live workshops with faculty and students. To access this and see how it works, press the green “present” button in the upper left. Piktochart offers an excellent alternative to Powerpoint for the creation of presentations. In the second infographic example, “Introduction to Memoir,” I built an infographic designed to work from the web. It has interactive elements including a video of my own creation, a YouTube video from other sources, and active links to other articles. 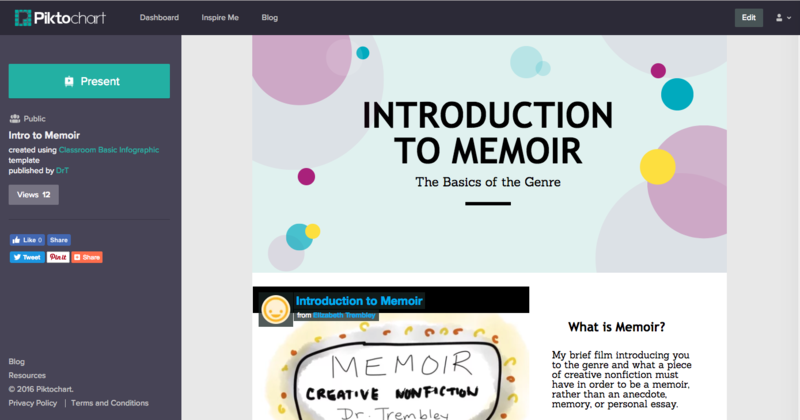 This infographic/website is designed to give my beginning creative writing students a first look at memoir and how they can approach an upcoming assignment. You can see that Piktochart offers an excellent platform for creating online lessons for the flipped, hybrid, or online classroom! I hope these two examples of basic uses for Piktochart help you imagine what you might do to bring exciting verbal and visual learning into your traditional or online course! In this short video interview, the the Associate Director at the Center for Faculty Development and Excellence at Emory University in Atlanta discusses her use of Piktochart, helping students use technology, and teaching the intricacies of data visualization. An interesting blog post about how one teacher used infographics to flip her classroom, both in terms of her presentation of material to her students as well as her students development of fluidity with the knowledge. As part of this little series on using Piktochart to create infographics (and more) in the classroom, I want to draw your attention to this wonderful blog post guiding students through use of the software. No need for instructors to reinvent the wheel with such good tutorials out there for us to use. And, this helped me find my own way through the software for the first time. In my last post I wrote about my excitement for the resource called Pictochart for creating infographics, interactive infographics, reports and slideshows.Check out this terrific “Tech Project Pack” on how to use Piktochart to create infographics in the classroom. Check out this terrific “Tech Project Pack” on how to use Piktochart to create infographics in the classroom. It not only includes step-by-step guides for educators who want to experiment with infographics, but it includes links to several excellent tutorial videos as well. Try Piktochart for Infographics, Slideshows, and More! The creation of infographics in the classroom requires teachers and students to understand the information they want to convey well enough to be able to synthesize details into main points and organize those points into a sensible presentation order. The creation of infographics also requires strengths in verbal and visual literacy to create effective multimodal communications. Infographics not only give instructors interesting ways to convey information to students, but (and really, this is my favorite way to use them) they also give students a complex and intriguing method for proving what they have learned and can do with course material. 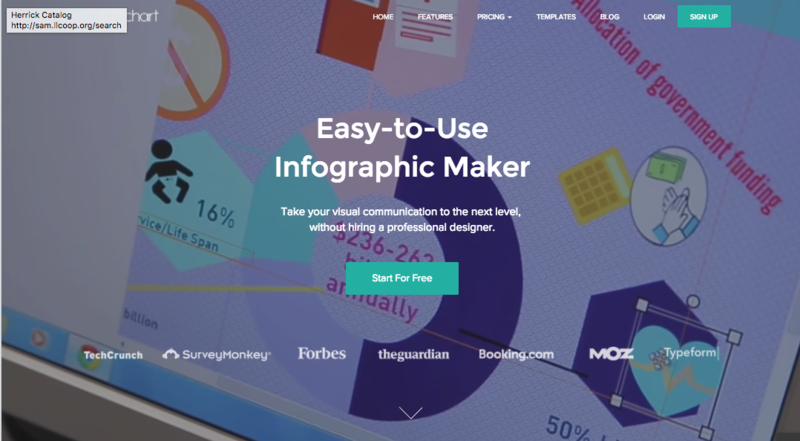 Piktochart provides a simple, online platform for the creation of infographics. The infographics you create there can be downloaded in a variety of graphic formats for printing, and sharing via social media and the like. But even more interesting!! The infographics can live in the cloud, so that users can access and interact with them. These infographics can contain live links, videos and so on, so that your users don’t just read, but click and engage. And for the icing on the cake: these infographics automatically sort themselves into slides, so that you can use them in presentation mode if you wish. Posted on February 6, 2017 Categories Combining Visual and Verbal, EdTech, EducationTags infographicsLeave a comment on Try Piktochart for Infographics, Slideshows, and More! Have you ever thought about using infographics either to help convey information to your students or to have your students present their learning to you? If so, you might get some excellent use from this “cheat sheet” of tips on infographic design. It points out six basic outlines for different purposes (like comparison, road map, and so on). It also briefly addresses the importance of basic principles like white space. In a few weeks, we’ll be featuring a few posts on the wonderful cloud-creation software, Piktochart. This article gives you a little taste of what’s to come.